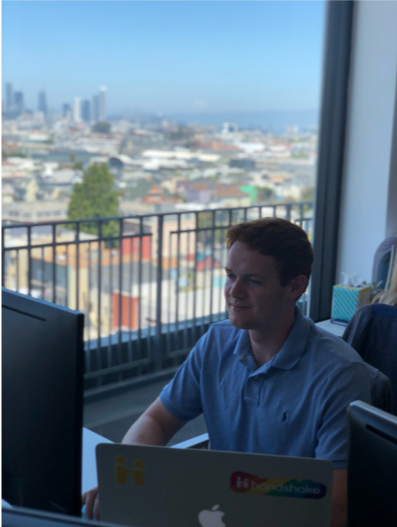 Duncan Roy ’19 Handshake – This summer I have had the opportunity to intern at Handshake here in San Francisco. Handshake is a tech startup that connects students of all backgrounds with great career opportunities. Going from Crawfordsville to San Francisco has been a huge change, but I’ve loved exploring a city so different than anywhere I’ve been before. At Handshake, I am working with the University Success Team, which is in charge of implementing new schools on the platform and ensuring that career centers and students have all the tools necessary to use Handshake to the fullest. My main project this summer has been working on a back to school toolkit to empower career centers will all of the tools needed to make sure their students get the most out of the platform and launch meaningful careers after graduation. One of my favorite parts about my project and working at Handshake, in general, is the collaborative nature of the office and projects. I have been working with almost every team on my project from design to product. I have also been presenting my ideas in meetings with the COO, and leaders from multiple teams across the company. One of the most influential things that I have taken from my internship so far is the power of feedback and collaboration. 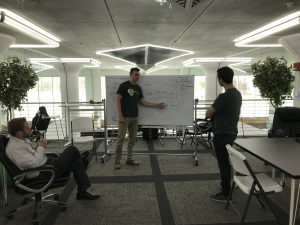 I have had many times where I have come up with a few ideas, then met with people from across the company to talk through my idea and get feedback, while bouncing ideas off of each other. Being at a tech company, I have learned something new every day just hearing conversations or talking with one of the other interns that are software engineers. It has been great to work in such a fast paced environment and be around be people that are driven to keep pushing the company forward and are truly passionate about what they are doing. Deciding to pack up a suitcase and move out here to a city I had never been to before was a little scary, but luckily the group of 7 other interns have been a lot of fun to get to know and hear their stories. Especially considering we are all from different parts of the country and have different backgrounds it has been cool to get their perspectives on things. It has also been cool getting to know fellow Wabash men Christian Rhodes ‘17 and Alex Amerling ‘14 here at Handshake. In all, this summer has given me a great opportunity to grow as a person and professionally and is helping me decide what route I want to take after graduation. I will forever be thankful for the great opportunity that I have had this summer! Maxwell Kurkowski ’20 Bridge Builder Strategies – This summer, I have been working for a start-up company called Bridge Builder Strategies. BBS is a consulting firm that’ mission is to develop strategies, processes and tactics that help organizations build bridges with their communities and create unique experiences that result in lasting relationships and impact. Along with the consulting firm, I am also assisting in developing a non-profit organization called The Crossroads Center for Social Impact. This organization aims to achieve maximum community impact and bring a better quality of life for our city and the people who live here. This will be done through collaborative partnerships with interested members of the community, funders, businesses, government, non-profits, educational institutions and the faith-based community. I have been working for Wabash Alum, Mike Simmons along with a current Wabash student, Micah Walker. My role this summer has mainly been the marketing aspect of Bridge Builder Strategies. However, this company being a start-up, I have had the opportunity to learn much more than just the marketing component. Some of the important roles I have assisted in include, strategy development and business planning, business development opportunities, social media strategy and website development. I have also attended business meetings associated with current and potential clients of Bridge Builder Strategies. During my internship, there are a few things that stick out to me that I have learned. As a whole, seeing how much time and work it takes to start a company has been eye opening to me. There are many things that go on behind the scene in a company that need to be done in order for a company to be successful. Seeing this happen first hand has been an experience that you cannot get in a classroom or online. I have also learned many basic marketing tools that are used by companies to help enhance their brand. There is much more to marketing than what you see. It has to do with empathizing with clients, building relationships, and understanding the needs and wants of customers. Business vocabulary is another skill that I have made strides in. During my internship, I have had to do tons of research. As I began reading countless articles and familiarizing myself with the field of work I am in, I realized that there are many words that I just had never seen before. This gave me lots of trouble understanding many important components of my role this summer. So, every time I read something I did not understand, I wrote it down, researched it and did my best to understand it. This was one of my biggest takeaways this summer. Understanding how to research properly and teach myself things online has been extremely helpful in my success this summer. The second half of my internship has been developing the official website for Bridge Builder Strategies. Before my internship, I had no knowledge of building a website. I was a bit nervous to take on this role, however, after much research, YouTube videos and playing around on the website editor, I can now say that I can build a website on my own. I am near the end of my internship and I am finishing up the Bridge Builder Strategies Website. I am extremely grateful I had the chance to work with Mike Simmons this summer. He has been an amazing mentor to me as well as an educator. I have learned more than I could’ve imagined this summer and I am excited to take what I have learned and apply it to school, future career opportunities, and my everyday life. 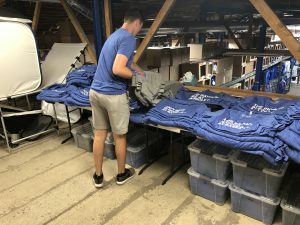 Justin Raters ’19 Obvious Shirts – During the spring semester, I was presented with the great opportunity to work for a small business by the name of Obvious Shirts. Obvious Shirts is a t-shirt company that began as a hobby for founder and owner Joe Johnson, Wabash class of 2011, but has blossomed into a very popular and interesting brand. As a huge Chicago Cubs fan, Joe began to make shirts that had funny, sarcastic, and obvious sayings about Cubs players on them. Since then, the shirts have become licensed by the Major League Baseball Players Association, and are now dipping into other fanbases such as New York and Washington D.C. As a huge Cubs fan myself, I was ecstatic to work for such a fun company while getting to enjoy being in Chicago for the summer. This position was very exciting for me because it was my first opportunity to work for a small business. It was great to see how much effort and work goes into running a small business, but also the many advantages there are as well. On a day to day basis, I would come into work and begin to collect the orders from the previous evening. I would then fill envelopes with t-shirts for each order and have them shipped to the customer. I was then given an email address that customers could reach out to with any problems or concerns they had about orders or navigating the website. I found that having this link between customer and staff was one of the most important pieces to making a small business run smoothly and be successful. Being in the office and on the computer was not the only thing I did this summer, though. Early on in my internship, I was able to be a part of selling shirts at a weekend long sports memorabilia convention in Chicago. It was clear that not only selling online but selling shirts in person was a very important piece in spreading the brand name and engaging with customers. It was great to hear customers’ stories about the comments they get on their shirts, and their ideas for new shirt designs. Working the convention, though a bit more stressful, was one of my favorite parts of my internship. Although my internship for the summer has ended, I will be continuing my work for Obvious Shirts by being a brand ambassador for the company. It is mine and Joe’s goal that Obvious Shirts will soon have a Wabash collection on the website, as well as the possibility of other colleges in Indiana. I am very grateful for this opportunity that was given to me by Joe Johnson ’11 and Roland Morin. 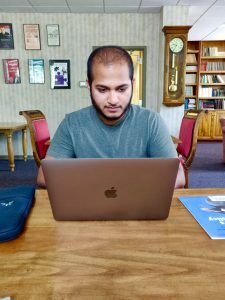 This internship gave me the experience that I was looking for in a small business setting and provided me with a number of connections that I am sure to use in the future. I am very excited to have had of such a fun summer opportunity, and to continue my work with Obvious Shirts in the future! 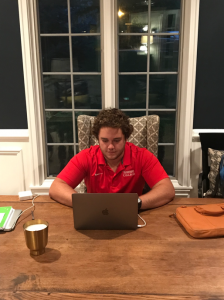 Josh Janak ‘21 Adorant Group – This summer, I have been working for a start-up company called Adorant Group. Adorant Group is led by Wabash graduate, Brian Mantel and the company is creating a platform called MyMoneyRoadMap. Since I am working on a platform, my internship has allowed me to work from my house because all my work is online. The platform is being created for financial advisors to purchase and help their clients be prepared for any of life’s financial needs. Instead of constantly calling the financial advisor, Adorant Group is creating an online platform that can instantly answer any of your financial questions. There are some competitors that sell similar products but very few have created anything as in-depth as the platform Adorant Group is establishing. Over the course of the summer, I have been presented with many different obstacles that have resulted in life lessons and valuable skills. Since Adorant Group company is a start-up, team meetings take place at unusual business hours. For example, every Tuesday night the team enters a google hangout room from 9pm to 11:15pm which have forced me to stay focused on my job and the goals at hand. Another skill that I learned was the value of good writing and online coding. Brian would task me with writing financial articles that were intended to be on the platform. These would be roughly 5-page in-dep th articles about a certain financial topic such as “buying a house.” After gaining a few skills in the writing, Brian asked me to begin coding certain webpages to be added into the platform. Since I am not an experienced coder, it took me a few days to understand how it worked but eventually, I began to master the process. Throughout the summer, I have learned and experienced what it is like to have a real job. Working for Adorant Group has been a positive example of the passion and energy is takes to make a product or service successful. The individuals on my team work on the platform after their job in order to make it as successful as possible. The most important skill that this summer internship has taught me is to find a career and work with passion in whatever job you attain. While working extra time for a start-up seems like a lot of work, the individuals are passionate about making this company successful. Adorant Group has taught me that drive and hard work is the key towards success. My internship with Adorant Group has been a valuable experience and I have learned some useful skills for my future career and internships. I thank Brian Mantel for his expertise and mentorship and wish his company nothing but the best. 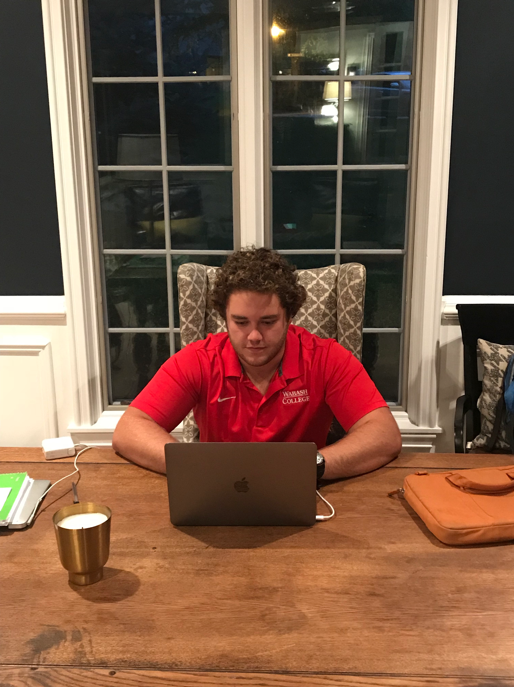 Trevor Hix ’19 Rotary Jail Museum – I’m Trevor Hix and I will be a senior this coming fall at Wabash College. My summer internship has been working with the Montgomery County Cultural Foundation at the Rotary Jail Museum. Built in 1881 and starting operations in 1882, the Rotary Jail of Crawfordsville is one of the hidden treasures most people don’t even know about. I had only heard of it through passing before my internship. With the summer approaching and time running out, I went to Roland Morin who helped place me at the Jail. The day-to-day things I do while at the jail are things like giving tours and working on escape rooms; that’s right, escape rooms. The main reasoning behind my internship is to design escape rooms for the Rotary Jail. The beginning of escape rooms being run out of the jail is multipurpose. One of the reasons for the escape rooms is to help bring money into the organization. Being a non-profit organization, sometimes it can be hard to pull in a lot of money at one time. Another purpose is to help reach out to the community. Entertainment can be hard to find, no matter the city you’re in. Some of the complaints I have heard from local community members is that there is never enough to do and they have to travel to places like Indianapolis, Terre Haute, or Lafayette for a fun evening. The escape rooms will give these community members the opportunity to have a fun evening without all the hassle of a drive. Finally, the escape rooms have benefited me almost more than anything. Being a Political Science major and Rhetoric, Psychology double minor, design has never really been a part of my education. It was nerve-racking just thinking about stepping into a field of work that I only had a passing-by knowledge on. But thanks to the Wabash College Liberal Arts education system, I have been able to utilize my critical thinking skills to rise to the challenge. Not only have the escape rooms gone well throughout this summer, but the Rotary Jail has also given me the opportunity to reach out to the community. At least once a month we do a free movie night that allows members from the community come to the Jail and have a nice relaxing evening. Also throughout the summer, we have held two Art Camps that let kids come in afternoons for a week and do fun arts and crafts. This internship has also given me an opportunity to outreach to the Wabash community even stronger. This coming October, the MCCF while be hosting a Haunted Jail that will be run in the Rotary Jail. My boss, Brittney Combs, has developed the idea to have the Haunted Jail become a scare competition between Wabash College and the school down south. This opportunity will help the Wabash Brotherhood give back to the community. Internships are one of the most essential you can do during your time at college; gaining experience, taking a chance in a field you may not know a lot about, and extending your network. No matter your previous experience, Wabash prepares you for anything. WAF. 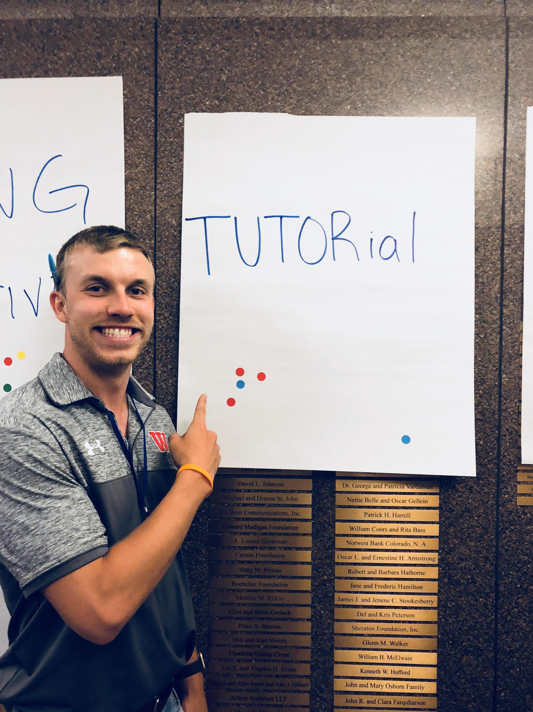 Ben Stachowski ‘19 enFocus – This summer I interned at enFocus in South Bend, IN. My internship consisted of working on two projects throughout my eight weeks in South Bend. Both projects required frequent client meetings, internal team meetings, research, and presentations. 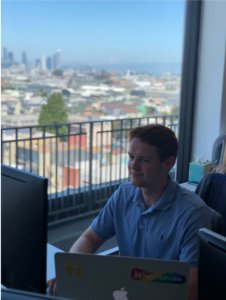 I sought to intern at enFocus because I wanted an internship that would allow me to grow my entrepreneurial and professional skills while getting the chance to make an impact on the projects that I worked on. enFocus’ brand promise is “Smart People. Bold Ideas. Greater Good.” This message means that enFocus believes that if they empower talent then they can help to build better communities by creating opportunities to start new ventures and innovate within existing organizations. In my first project, an enFocus fellow and I worked with the Elkhart County Solid Waste Management District to implement a recycling education program into the Elkhart County Schools. This project was in its very beginning stages, so I had to complete a couple of weeks of best practice research before I could start convening focus groups and taking site visits. Once research was completed, I set-up these meetings and helped to facilitate a handful of them to gauge the best ways to get recycling curriculum into the schools. After hearing from many different schools in the community, we realized that many of them did not even recycle. As many consultants and entrepreneurs have to do, we had to make a pivot in our project and turn our focus to getting recycling bins into the schools before we could implement the recycling education curriculum. I finished my project by presenting my findings to the Elkhart Solid Waste Management Advisory Board and writing an internal final report for the next fellow that was going to continue this project and to the advisory board to summarize what we had completed and a timeline for the future. The hopes are to have this project off the ground by the beginning of next school year. As for my second project. I worked with another intern and fellow to create a business plan for a film office in Goshen, IN. This project had a lot of client meetings to grasp the interest for the film office and surveying filmmakers in the area to figure out what was important when creating a film office. Once collecting this data, we performed a market analysis and then wrote the business plan. Off of the business plan, we created a presentation that would later be presented to the City of Goshen. Overall this internship has been a great experience. The fellows were very welcoming and open to any and all of the intern’s ideas. There was truly a family atmosphere at enFocus, which allowed everyone the opportunity to work at their peak potential. I would especially like to thank Patrick Jones (Class of ’15) who is the Program Director at enFocus and the CIBE for giving me this great opportunity. I am very confident that this internship will help me in my future endeavors. 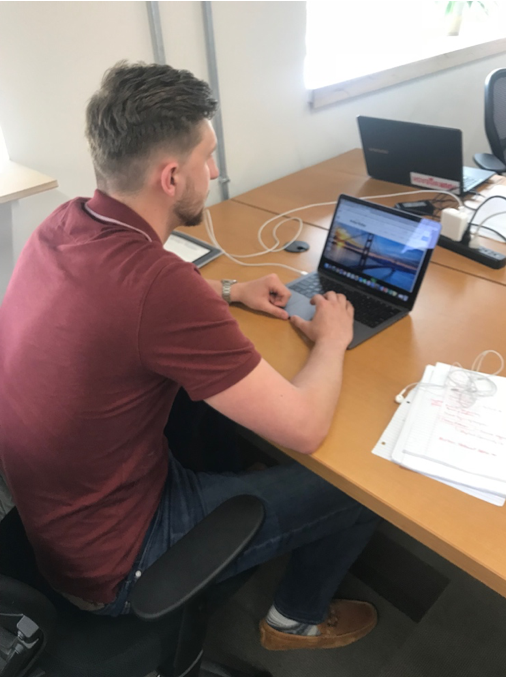 James Schulz ’19 HireEducation – This summer, I took a big leap and left my hometown of Fishers, In to work in Boulder, Colorado. I am an intern at HireEducation, a recruiting firm in the education technology space. My role here as has been in the research and recruiting part of the business. Since coming out here, there are three things that come to mind that have stuck out to me most. The first is when my expectations don’t quite line up with reality, it’s important to keep an open mind. I came out to Boulder thinking I was going to be doing cold call outreach and assisting with ongoing searches to help find suitable candidates. However, that was not the case. I spent the first five weeks reorganizing an entire office and putting together/taking apart furniture. Many times, I would find myself with copious amounts of downtime, despite asking for more and more things to do. I grew frustrated and felt like my presence in the office was a nuisance. However, I’ve come to realize that I can take this experience, these feelings, and use them to my advantage if ever asked to talk about a work experience that did not as I expected. By keeping an open mind, I was able to flip these feelings of frustration into a valuable learning experience. The second thing that comes to mind is starting a company is no easy task. In my very first weekend in Colorado, I attended TechStars Start-Up weekend in Denver. People from all over the country came to this event, pitched an idea, and the top pitch ideas spent the rest of the weekend coming up with a business plan to present on Sunday night. I even pitched my own business idea in front of an audience of 100+ people. Even though my idea did not win, I was fortunate enough to work on a team that helped create a mentoring app connecting foster children who are on the verge of aging out of a system to a m entor willing to help with those scary years of entering adulthood. My team members were from Utah, Colorado, Minnesota, Venezuela, California, and Vietnam. Though my team did not win, I learned what the beginning aspects of putting a business together are like and how working with a team from various backgrounds is so great. I also came to understand the amount of excruciatingly tough hours it takes to start a business. The third thing that comes to mind is stepping out of my comfort zone has been one of the most rewarding experiences of my life. Committing to come out to Boulder was a first for many things. It was my first time living in a different state for an extended period of time. It was my first time ever being in Colorado. It was my first time living on my own, in my own place. It was my very first experience with sales and a recruiting. All of these aspects were brand new to me, but the best things have come of them. I have developed relationships that I will keep for a lifetime. I have gone on adventures in one of the most beautiful states in the country. I have found a career field that I have considered before, but now can picture myself pursuing post-graduation. Despite the challenges I have faced this summer, the rewards completely outweigh them all. My time in Boulder will be an experience I can talk about for a lifetime, and it would not be possible without Wabash. The “Wabash Always Fights” mentality never left the back of my mind and has proven to be successful once again. Thank you to HireEducation, my family, and Wabash. 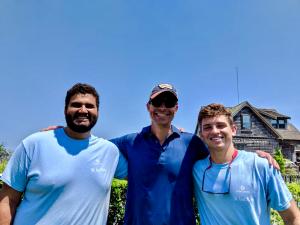 Waleed Elrefai ‘20 Nantucket Bike Tours – Going into the summer, I had the difficult decision of deciding between spending the summer with Jason and Courtney at Nantucket Bike Tours or spending the summer in D.C. with a political internship. Ultimately what swayed me to accept the position with NBT was the fact that I believed that I would learn skills here that would transfer to any avenue that I decided to pursue. At this point, I can safely say that I was right in that decision and I have no regrets. Since coming here, Marcus Torres and I hav e undergone round the clock leadership, awareness, emotional intelligence, and small business training while having had the opportunity to practice all that we’ve learned in professional and social settings. I am very thankful to Jason (’98) and Courtney Bridges, the owners of Nantucket Bike Tours, for giving us time in their already very busy lives to help develop us as well as the SBIF for making this possible. Over the last several weeks I’ve developed a much better understanding of how awareness and emotional intelligence factor into both leadership and giving a great bike tour. From the moment people arrive it is your responsibility as the guide to set the mood. It’s important that everyone is comfortable and that you can demonstrate that you are both trustworthy and welcoming while still making it known that you are the leader of the group. Striking that balance helps you assure that people will work with you to stay safe but also have a great time. Of course, that translates very naturally to any professional setting where it’s important for a leader to be able to project both warmth and competence to get a team to trust and work with you. While you’re on the bike there are countless things to take in such as the traffic conditions, clients’ interests, heat, the skill of riders, and body language. Every day we work on observing and processing all that is going on around us so we can improve our awareness in every situation, there are countless applications of this in daily life. We’ve already used our new awareness skills at social situations town meetings and volunteering events. Being able to know what’s going on around you is such a vitally important leadership skill that I’m very fortunate to have been able to work on this summer. Many of the things I’ve learned this summer would have been much more difficult to practice outside of a small business setting. I think that more than anything that I’ve learned the most this summer is the value of taking initiative. In school and at previous jobs growing up I had no problem being a good student or employee and doing as I was told. In a small business, there isn’t a big hierarchy above your head that sends orders down. It’s up to the small team to have good foresight and plan ahead to tackle problems before they come up. Working in a small company gives you the opportunity to wear many hats such as sales, marketing, tour guide, customer relations manager, and bike mechanic. More than anything else I’ve learned to embrace the umbrella of responsibility and look ahead at what needs to be done without having someone tell me directly. To close, I’d like to reiterate my sincere thanks to Jason, Courtney, and all the people who make the SBIF possible. I’ve learned so much more about how to be a leader in business and life, and I couldn’t be more appreciative of everyone who has helped me along the way. Marcus Torres ’20 Nantucket Bike Tours – Six weeks ago, I disembarked the Hy-line speed ferry having finally arrived to the island of Nantucket. After grabbing my bags from the ferry, I made my way down the dock to find Jason Bridges ’98 and Waleed (Weedy) Elrefai ’20 patiently waiting for my arrival. What’s the first thing Jason ’98 says? : “Look around and take in everything you’re seeing because these next 10 weeks are going to fly by.” As I sit here at the Handlebar café six weeks later while writing this blog I realize he couldn’t have been more right. 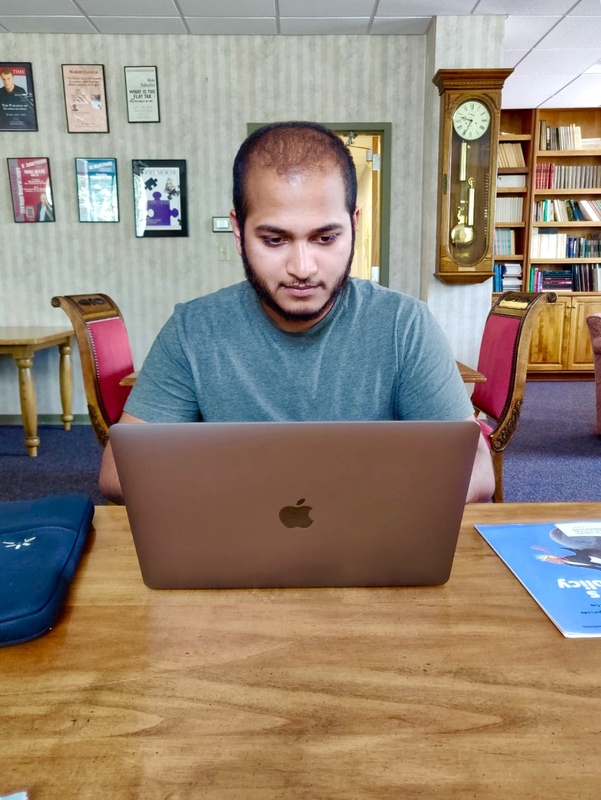 As I sought out internship opportunities this past spring semester, I knew I wanted to gain experience that would be applicable and beneficial to all aspects of my life, both personal and professional. I wanted an experience that would mold me into the leader I hope to be. Interning at Nantucket Bike Tours (NBT) has done just that. This internship has been far from typical. 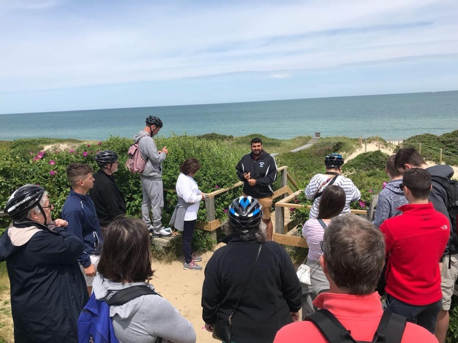 As for all internships, if one hopes to gain any kind of experience they must “buy in.” However, this “buy in” is amped up to the next level here at Nantucket Bike Tours. Both Jason ’98 and Courtney Bridges expect the most from Waleed ’20 and I, and not only do they have high expectations, but they devote all of their time to helping us exceed these expectations. For that alone, I have been super thankful. What is it like interning for Nantucket Bike Tours? We like to refer to this internship as “awareness boot camp.” From the moment we wake up (5:30am-6) to the moment we go to bed (10pm), our social awareness must always be “on” and our leadership must set in. Whether we’re walking down the sidewalk, eating breakfast at the Bridges’ home, or giving a tour to a 15-person group, we must be willing to engage others, smile and keep a friendly and genuine persona. The bike tours serve as a vehicle that allow us to improve upon our emotional intelligence, people skills and small business acumen. Each and every day we engage in new conversation, meet and connect with new people, and become interested in others. It’s easier said than done. This brings me to the first and most valuable lesson I’ve learned up to this point: the power, value, and importance of people and relationships. As humans, we naturally seek interactions with others, however, more often than not, we tend not to engage others. After only six weeks of this internship, I sit back now and think, “how could I have been so stubborn as to not connect with and see the value in people like I do now?” There were definitely missed opportunities in the past, but thankfully, there will be tons more in the future. Prior to embarking on this Nantucket journey, I had also hoped to become more confident in social and larger group settings. After six weeks of giving tours to 15+ people, attending community fundraisers and engaging in other activities which require public speaking involvement on my part, this goal of mine has become attainable. There is still a ton of work to be done, but with people like Jason and Courtney who care about our personal development and think so highly of us, it will be much easier getting to where I want to be. With hopes of working in the International Business field, this internship has provided me with the foundational knowledge of what it is like to run and manage a business; from sales to marketing to customer service, this business knowledge of mine is all coming into fruition.